EFORT: Are Orthopaedic and Trauma implants safe? EFORT > Statements > EFORT: Are Orthopaedic and Trauma implants safe? In the third week of November a large collective of journalists published articles about the safety of surgical implants in Europe. In both newspapers and on television they criticized the safety of some of the implants. They also criticized the process in Europe for evaluation of implants before they are allowed onto the market. The European Federation of Orthopaedics and Traumatology (EFORT) represents all European orthopaedic and trauma surgeons. All these surgeons use surgical implants on a daily basis to treat their patients in order to reduce their complaints and improve the quality of their life. The quality of the implants used and the safety of these implants is of the highest importance to EFORT and its members. Overall, orthopaedic implants are safe and highly successful. For example, hip replacement has been described in the Lancet as “the operation of the century”, and many of them now last well in excess of 20 years. On this basis, the number of orthopaedic implant procedures has increased enormously over the last 20 years. Implantation of knee and hip implants are amongst the most frequently performed operations worldwide. In trauma care the use of metal plates and pins has improved the speed and extent of recovery from serious injury enormously. The implants available for orthopaedic surgeons to use are now regulated by the European Union, and the Regulatory frame work is currently being re-organised. We fully agree that it is vital to protect patients by preventing unsafe implants coming onto the market. Therefore, EFORT, together with some other European organizations, has during the last year offered to support the new European Union process professionally in the evaluation of implants before they are allowed to be sold to the hospitals and clinics. For more than 25 years, orthopaedic surgeons all over Europe have taken the initiative to systematically collect data about the quality of implants and they were the first surgeons to do so. Nowadays, many countries have registries of joint implants which follow the outcome of implants used. These registries provide essential data for monitoring implant performance and, together, European registries already contain data about many millions of implanted joint replacements and are monitoring the implants currently functioning in European citizens. EFORT is championing the development of a far wider variety of these registries across Europe. 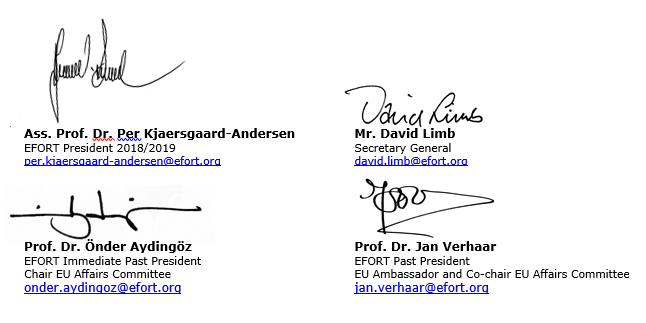 EFORT promotes the exchange of knowledge from the registries within Europe and has a special committee to organize such collaboration (https://www.efort.org/nore). The committee also support initiatives in European countries, which do not yet have any registries. It is sometimes impossible to be certain that an implant will perform as expected, even after extensive testing but with good registries, implants that have passed the initial evaluation but turn out to be inferior to established implants in use can be recognized as poorly performing and can be taken off the market as soon as possible. EFORT is also closely working together with ODEP (http://www.odep.org.uk/), an international panel of experts who benchmark joint replacement implants closely and evaluate their efficacy. This panel has been providing this service for free to the orthopaedic community for 15 years. The use of implants with a long history of good results is encouraged by this process and the average hip or knee replacement should thus be able to demonstrate a good result at a follow-up of at least 10 years. The results of the use of implants is also dependent on the training of surgeons. EFORT provides and promotes the best independent training and education for trauma and orthopaedic surgeons Europe-wide. Independence of training is important to avoid conflicts of interest whereby the Implant Industry, or others, might seek to influence usage of their products for reasons other than clinical effectiveness, though their role in providing education in the correct use of their own product range is also recognised. A critical and independent approach is essential in training, as in research. EFORT calls for the governments of European countries to support independent implant research, which is currently very much dependent on financial support from the industry that markets the same implants. Supporting the registries is another tool governments can use to improve quality control of implants. This support should be financial in nature, to support the process, but can usefully also take the form of making the Registration of data mandatory. Politicians and the public can be reassured that orthopaedic and trauma surgeons are on the same side as patients in wishing to have the best and safest implants. EFORT is already heavily involved in trying to achieve this aim, and we call upon governments throughout Europe to be more active in pursuing this essential goal.